In a criterium, a bell is sounded on the lap preceding the prime sprint at the appropriate line for that prime sprint. The line used for prime sprints need not be the same as the start or finish line. Primes may be either predetermined for certain laps or spontaneously designated under the supervision of the Chief Referee. All primes won shall be awarded to riders even if they withdraw from the race. 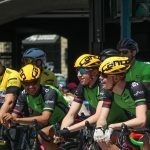 Lapped riders are not eligible for primes except in the following situation: when a breakaway has lapped the main field, riders in the main field and the breakaway riders are then both eligible for primes. When primes are announced for a given group, only riders in that group or behind it at the beginning of the prime lap are eligible. 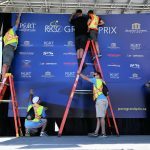 The ‘Crowd Prime’ typically happens near that end of the race, and with all of donations pooled together (and split evenly between the men’s and women’s races), the announcers will ring the bell one final time, letting the riders know that the ‘Crowd Prime’ is on the line. 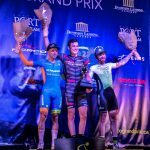 The cash prize on this prime lap, often nearing one thousand dollars or more, means those riders are going to be flying as they sprint to the line. Even still, they won’t want to use up all their energy on the ‘Crowd Prime’, because the final bell lap is just around the corner, marking yet another sprint to the finish for a spot on the podium. Sponsoring a prime lap is an excellent way to buy your business some air time at the PoCo Grand Prix. If you’re interested in sponsoring a prime with a cash donation, please email our team at grandprix@portcoquitlam.ca.